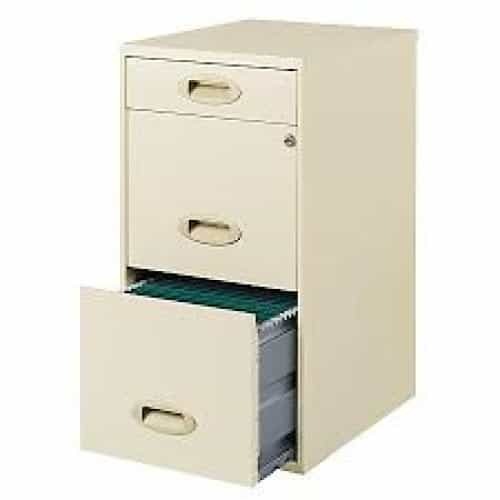 Every office requires versatile storage solutions for important paperwork, and a small filing cabinet fits the bill perfectly. The SaveSpace 3-drawer organizer file keeps essential documents neatly organized, allowing you to find what you need at a moment's notice. Patented drawer-glide suspension for smooth drawer performance. 3-drawer filing cabinet design features 1 pencil/storage drawer and 2 high-sided drawers. High-sided drawers are ready to accept hanging file folders and are 18" deep for ample storage. Lock secures the top 2 drawers to keep your files and items private. I have a really small office space but I needed a file cabinet to get my papers and files organized. The SaveSpace file cabinet has been a compact organizational lifesaver. Perfect for my office space. SaveSpace file cabinet was exactly what I needed to help me organize my office. It's compact, but large enough to hold all of my client's portfolios in an organized way.